COVINGTON, Ky. -- Jake Walter figured basketball was the game for him after a season of freshman football a few years ago. "Being tall, it was hard to get low on everybody and actually have leverage on them," said Walter, now a 7-foot-1-inch senior center on the unbeaten Covington Catholic basketball team. Walter is the son of former Bengals star offensive lineman Joe Walter, who was the starting right tackle on the 1988 American Football Conference champions that played in Super Bowl XXIII in Miami. But football just wasn't in the cards for the younger Walter. "With my dad playing, I had all that pressure," Jake Walter said. "So, I just made it easier on myself and concentrated on one sport." Good thing for the hardwood Colonels, too. Walter has committed to Xavier University and is the third-leading scorer and top rebounder for CovCath (5-0), which is an early favorite in the Ninth Region. He entered Friday's game averaging 10.8 points and 6.0 rebounds, and scored 16 points with a team-best 12 rebounds in a 67-49 win over Cincinnati La Salle (1-1), a perennial power in the Greater Catholic League South, at CovCath. 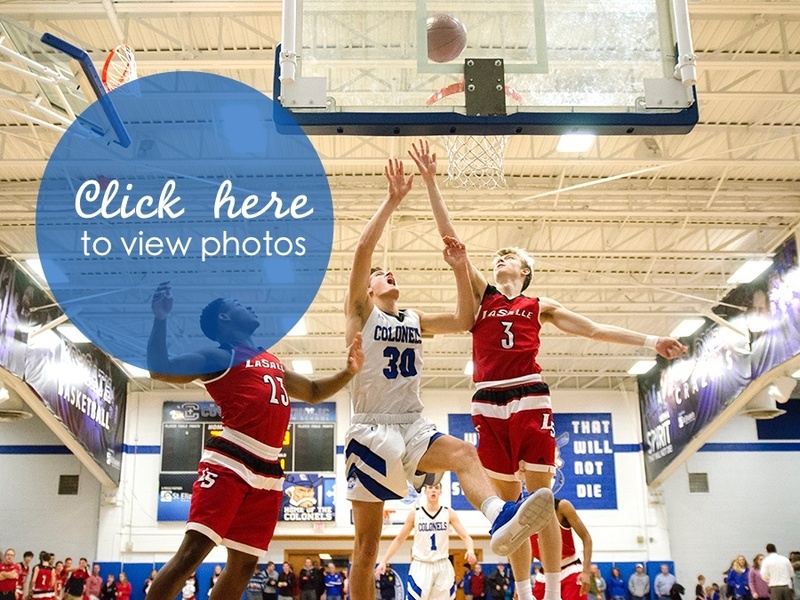 While the stout La Salle defense was giving senior guard and leading scorer CJ Fredrick fits in the first half, Walter scored the first six points of the game for CovCath and led the team with 10 points and 10 rebounds at halftime. "He was really big for us tonight," Fredrick said. Although he has always had the height advantage, it's been a long road for Walter to become the basketball player he is these days in the shape he's in these days. "Going into sophomore year, I was like 325 pounds, so I didn't know if I could play high school," Jake Walter said. "Thanks to Coach (Brandon) Elliott and Coach (Joe) Fredrick and (head coach Scott) Ruthsatz, they helped me lose the weight." Walter worked with coaches on a lot more than basketball. "He had to come see me on the sidelines sometimes," Elliott said. "I'd have him doing wall-sits and burpees and things of that nature, jumping rope and line jumping. And playing against me, of course." He also boxed during the summer before his sophomore and junior years at CovCath on Mondays, Wednesdays and Fridays while also participating in team conditioning on Tuesdays and Thursdays. It worked. He lost 75 pounds and is now on his way to becoming a Division I college basketball player. "He had the skills of a big man and the will to keep going," Elliott said. "It takes that heart and that willpower to keep going." Walter has developed into a big man with great feel for his teammates around the court and a good passer for his position with good hands and a good feel around the basket to score. "I love Jake," CJ Fredrick said. "He's been my best friend since freshman year. He's just a great person and a great friend. He's great to play with. As a scorer, he gets you open and he sets wonderful screens. He's got great hands for a 7-footer. The way he finishes around the rim is just essential to our team." Those qualities were on display Friday against La Salle when Walter was the key player during a close first half. The Colonels led 33-26 at halftime before using a 20-0 run spanning the third and fourth quarters to turn a 39-33 third-quarter lead into a blowout. Senior guard Aiden Ruthsatz led CovCath with 17 points and Fredrick added 14 after being held to six points in the first half. It was a win set up in large part by Walter down low throughout the game. "They don't really have the best size for a team like us," Walter said. "We only have a couple players under 6-foot. It makes it easy when a team tries to scrap, just hold the ball up high. They were trying to take CJ away, and it just opened me up more. I knew they weren't going to double-team me as easily."